Throughout the last year, a number of serious questions have been raised over the tools employed by the former Uribe administration (2002-2010) to establish and maintain a secure, stable Colombia. The August 31, 2011 resignation of Rodrigo Rivera, Defense Minister under the recently inaugurated president Juan Manuel Santos, presents a useful opportunity to reflect on the security policy under the new head of state and Colombia’s qualifications as a free trade partner. Up until now, President Santos appears to have maintained the overall security language and posture employed by the Uribe regime: a repertoire of terms familiar to the post-September-11 world. This indicates that labeling enemies as ‘terrorists’ and more specifically in Colombia as ‘narco-terrorists’ is the order of the day. With the ten-year anniversary of September 11 just past, one may reflect on the ramifications of such carefully crafted and precisely targeted language observed in the last decade of Colombian foreign policy. This language, to a large extent, removes the possibility of a real political solution, and in its place, frames the politics of war and violence as the only viable means of achieving peace in the violence-wrecked nation of Colombia. However, there are signs that this paradigm might be evolving into something else. President Santos, by labeling illegally armed actors as ‘delinquents’ and ‘criminals’, marked a recent significant departure from the hardly nuanced dialogue of his predecessor, Uribe. In fact, such language has not been heard since before the Pastrana regime (1998-2002) and it foretells— perhaps falsely, or at least somewhat optimistically— the return of dialogue and the embracing of a political solution to Colombia’s long-standing armed conflict. Despite this progress, as long as the current repertoire of words such as ‘narcoterrorism’ exist and are being reliably employed, the slender possibility of a political solution to Colombia’s internal security issues will remain all but invisible amidst the fog of war. Of course, it cannot be refuted that in the short term, Uribe’s policies have been vindicated in Washington and Bogotá as being critical to assuring the military security in Colombia and guaranteeing that the FARC and other illegal armed actors are pushed further into remote and scattered jungle locations. Nevertheless, Santos’ short-term policies appear to be yielding what could be dangerous long-term effects for the Colombian state, especially with regard to strengthening domestic and international law. President Uribe’s “War on Terror” has been an affliction on Latin American democracy, due to the alleged wiretapping and monitoring of journalists, activists, and political opponents. In fact, Uribe’s murderous policies are reflected in the fact that his own director of the Department of Security (DAS) awaits trial for collaborating with paramilitary groups in various killings, while other members of his administration, including his own Chief of Staff and Minister of Agriculture, face criminal charges and considerable jail time. It seems that President Santos has a fundamental decision to make. He could continue dismantling and eroding public confidence by coming forth with a policy of benign posturing toward peace, but one that still dwells on war, violence, and corruption. On the other hand, Santos could reframe the security situation in Colombia by introducing a new dialogue that would create the possibility of an effective peace with the FARC and uphold the basic legal and political rights of all Colombian citizens. Up to now, we have been witnessing a conflicting policy: Santos speaks both positively and constructively regarding his irascible but essential neighbor, Venezuela’s Hugo Chávez, while he also stakes out positions befitting an authentic Colombian nationalist. Santos is dangerously close to forgoing his role as an effective interlocutor between the U.S. and Latin America and becoming nothing more than a toothless spectator. 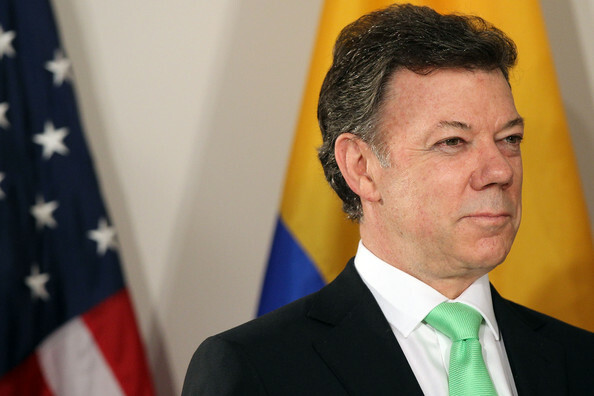 Santos has been alluding to the new, peaceful route, and if he ultimately decides to reframe security in Colombia, he may very well pull off a law-abiding and effective Colombian state, even if he becomes plagued by new discoveries of political corruption and dirty actions by the police and armed forces’ high command. This analysis was prepared by COHA Guest Scholar Robert Works. To read more about Colombia, click here.